Contest offers entrants the chance to win a free trip anywhere in the world. BERKELEY, Calif. - May 21, 2018 - PRLog -- Go Overseas is proud to announce their annual Go Overseas Again Contest. This contest encourages travelers to share their stories and experiences from past trips, for the chance to win a future trip anywhere in the world. For the 2018 campaign, Go Overseas is offering one lucky winner the chance to win a 'Trip of a Lifetime' worth up to $1,000 and a $1,500 flight voucher provided by StudentUniverse. Additional prizes will be given away throughout the campaign including gift cards provided by Hostelling International, and Patagonia travel gear. Smaller prizes are given away weekly to entrants; the final drawing will be held after the contest ends on June 8, 2018. As in previous campaigns, travelers can enter by leaving a review on Go Overseas for one of the programs listed on the website. Entrants can earn additional chances to win by referring friends to leave a review too. 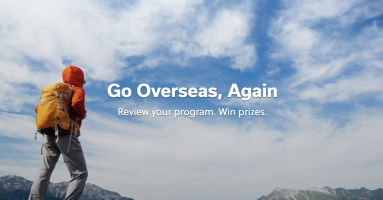 To enter, visit https://www.gooverseas.com/go-overseas-again-contest and select the program you would like to review. The contest runs through 11:59 pm PST on June 8, 2018, and the winner will be drawn and contacted from all eligible entrants no later than June 30, 2018. Go Overseas was started in 2010 with a mission to connect travelers and inspire meaningful travel overseas. With reviews and resources covering topics including study abroad, volunteering abroad, gap years, and even language learning and tours around the world, travelers can trust Go Overseas for honest, authentic, and accurate information for every travel program on our site.